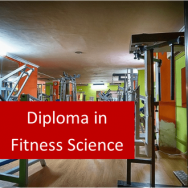 Advanced Diploma in Fitness Science online: Being fit or "fitness" in the context of this course, means the level a person reaches in terms of endurance, speed or strength. "Darwinian Fitness", or the term "fitness" in the context of biology however, is a term used in association with the evolutionary concept of survival of the fittest. Although there is little danger of the human race becoming extinct due to a lack of exercise, individuals general health and well-being, whether they lead a long and active life or their ability to recover from illness, are all affected by how physically fit they are. In sport, fitness science provides the foundation for success, helping athletes, footballers and other sportsmen and sportswomen to reach peak condition, in order to compete to a high standard and for long periods of time. You can begin your career in health and fitness by completing one or more of our short fitness leaders courses. 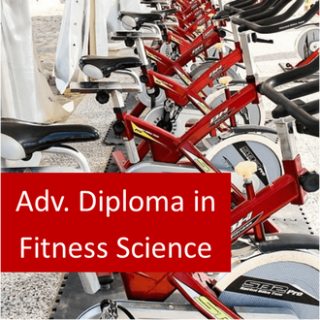 However this Advanced Diploma builds on these by looking at the science behind getting fit, making it an ideal and substantial program to help you really stand out from the crowd when applying for fitness employment or promotion. If you already have relevant qualifications and don't need to take our Health & Fitness modules, why not look at our dedicated Diploma in Fitness Science for your continuing professional development? Employers will always value any experience, skills and self-starters so in completing this course, you will be showing that you are passionate about health and fitness and have a real desire to be the best at what you do. Please note that if you don't have valid and up-to-date first aid certificate, it is advisable to gain one in addition to completing this course. 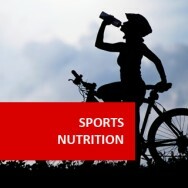 To explain the nature of the health and fitness industries. 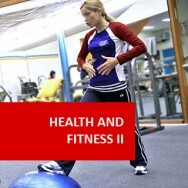 To explain the relationship between the body and health, fitness & exercise, with reference to physiological processes. 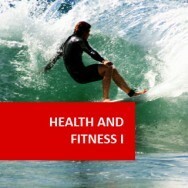 To explain the relationship between the body and health, fitness & exercise, with respect to risk involved in exercise. To evaluate body movements during different exercises. To design fitness programs, which are both safe and effective, to fulfil specified requirements of an individual. To deliver a fitness program to a small group of clients. 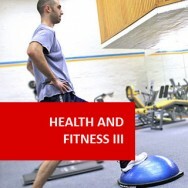 To manage the well-being of participants in a fitness program, including safety and injury. To design fitness programs, which are both safe and effective, catering to needs of special populations (including weight control programs and programs for handicapped/disabled persons). Explain the relationship between fitness and well-being. Determine a persons level of health and fitness according to physiological data. Manage fitness testing services to a standard practised in gymnasiums and health clubs. Design Fitness Tests to a standard practised in gymnasiums and health clubs. Explain the management of resistance training, including equipment and exercise programs. Manage exercise programs, including monitoring and recommendations. Effectively lead a fitness program, to any number of people, including large groups or on an individual basis. Explain health risk factors in modern society. Analyse the health care system, to determine preferred options for different individuals. Determine social factors which may effect the status of health and fitness. Evaluate different individual approaches to managing health and fitness, including both services and facilities. Compare different fitness tests for different motor abilities. Demonstrate statistical techniques used to analyse fitness test results. Use fitness tests to analyse different sports skills. The approximate duration of the program is 800 study hours, although this is only a guide and we encourage you to work at your own pace. There are no deadlines for assignments and you are not required to complete your studies by a specified end date. You are in control of how much you learn. If you work in the industry that you have been studying; you may submit a reference from your employer, in an effort to satisfy this industry (ie. workplace project) requirement; on the basis of RPL (ie. recognition for prior learning), achieved through your current and past work experience. The reference must indicate that you have skills and an awareness of your industry, which is sufficient for you to work in a position of responsibility. This project is a major part of the course involving the number of hours relevant to the course (see above). Although the course does not contain mandatory work requirements, work experience is seen as highly desirable. This project is based on applications in the work place and specifically aims to provide the student with the opportunity to apply and integrate skills and knowledge developed through various areas of formal study. Students will be assessed on how well they achieve the goals and outcomes they originally set as part of their negotiations with their tutor. During each 100 hours of the project, the students will present three short progress reports. These progress reports will be taken into account when evaluating the final submission. The tutor must be satisfied that the work submitted is original.